See what's in store for you with Carib Select. Discover the Beauty of The Cayman Islands. Learn All About Our World-Famous Stingrays. 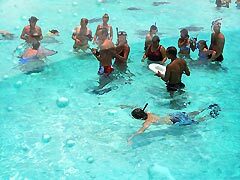 Stingray City is The Cayman Islands' most popular site. There are some 30 to 40 gentle Southern Stingrays swimming freely in 3—5ft of crystal clear waters, eagerly waiting to see what you've brought them for lunch. Get ready for an excitingly unique adventure, as you swim amongst the stingrays, some of the friendliest sea creatures in the world! Photo Packages burned to CD, ready when the boat reaches the dock. Paid for separately (Cash, Visa, MasterCard, Discovery). 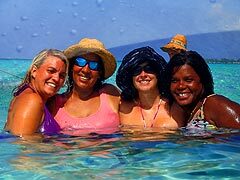 Friendly faces and a memorable vacation! Carib Select's crew will catch and teach you about our beautiful rays, then demonstrate how to pet, hand-feed and hold these gentle creatures. While you're playing with the rays, a Carib Select Photographer will capture the excitement of this once-in-a-lifetime adventure. The Cayman Islands is the only place in the world where you can handle these velvety smooth creatures while in their natural environment. And we want to make sure you remember it for years to come. 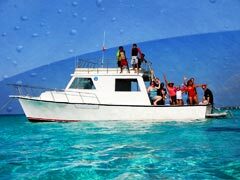 On the way to the vivid Coral Gardens or The Barrier Reef, your photos are uploaded to a laptop onboard the boat for easy viewing and purchase. Coral Gardens and The Barrier Reef will take your breath away. There, you'll snorkel with an incredible variety of tropical fish, friendly Moray Eels, amazing underwater plants and a bizarre array of other sea life. Both sites feature some of the most spectacular coral formations in the world, easily seen from above, in clear, turquoise waters. If this is your first time snorkeling, "No worries, man!" Our crew loves to teach the newcomers; young, old and in-between. Our gorgeous waters are waiting for you! Book A Trip Now! And take your first step on an amazing adventure! © 2010— Carib Select Watersports, Cayman Islands. All Rights Reserved.